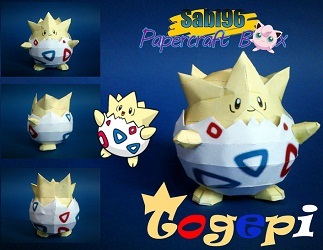 Togepi (トゲピー Togepī?) is a Pokémon in Nintendo and Game Freak’s Pokémon franchise. Created by Ken Sugimori, Togepi first appeared in the Pokémon anime. It then appeared in the video games Pokémon Gold and Silver and subsequent sequels, later appearing in various merchandise, spinoff titles, and animated and printed adaptations of the franchise. This entry was posted in Pokemon on 30/12/2014 by ToyXD.